With the variety of drone applications growing at an exponential rate, there has been an increase in the types of drones being manufactured. However, the industries do not seem to be keeping up with the scientific community. 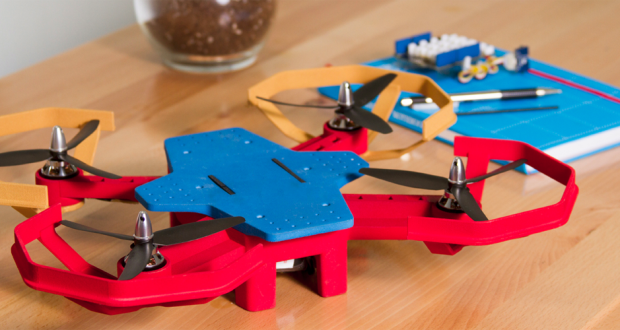 Fortunately, SkyWorks has come up with a simple solution, a DIY Drone. 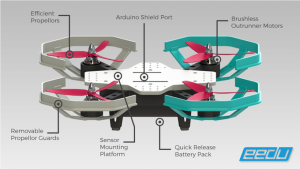 Building a specialized drone for a single purpose may sound like weeks of hard labor, but the drone kit from SkyWorks deals with this problem. With the new drone kit, you can easily build drones that can see, smell or even play laser tag. SkyWorks aims to change drones to be more than just flying cameras. As per the COO of SkyWorks, Jinger Zeng, his company wants to explore all the five senses using drones. An Eedu, as the kit is being called, requires you to use a normal wrench, with a hint of patience to make the drone of your choice. Since the complexity of robotics has been taken care of, it only takes around 30-minutes to put the components together. Other drone giants like DJI and 3D Robotics have also started to make platforms, instead of high end drones, but they are still keeping drones limited to photography. SkyWorks, on the other hand, wants to bring more innovation. There are a number of sensors that are a part of the kit, which SkyWorks wants you to experiment with. Even the programming part of the drone has been kept open for public, so you have complete control over what the drone can and cannot do. Additionally, SkyWorks is aiming to keep all the possible innovations Open Source. This would mean that anyone can use anyone else’s custom built drone and code and use it for their own applications. Quick alterations and updates would also help open a new way to a larger number of drone applications.